Anyone who is reading this that owns their own business knows the realities of this self-employment game. You are your own boss, which comes with a multitude of freedoms but also a large dose of additional responsibilities. There are times when working for yourself is a cakewalk, you can sleep in if the work is not calling, or take the day off if workload permits. It takes a keen sense of self-motivation to be your own boss, because those times when you get to fly kites in the park on a Tuesday afternoon are extremely rare in this economy. In today's brutal business environment, the "norm" is to work 24/7/365 while doing your best imitation of those crazy Plate Spinner Dudes who used to show up on The Ed Sullivan Show when I was 10 years old. Today, "self-employed" means you work long, hard hours, weekends and double shifts if that's what the client needs you to do. Recently, my ad agency has been on a tear. We rep a number of performing arts non-profits, and it seems they all needed a new website makeover yesterday. Timing is critical too, since they use these sites for online ticket sales, so putting them off is not an option. Fold a couple of business trips and an alleged vacation into the mix, and you can see I've been burning the candle in the middle AND on both ends. Ask any pilot with their own airplane housed at a hanger, and they will agree with me that sometimes, we just HAVE to go out to the hanger alone and just, well, hang. We aviators need to spend some quality time around the plane, just tinkering. Tighten a screw here, air up a tire there, sweep the floor, again. In the hanger, we can lose ourselves in aviation, becoming one with our flying machine. And when we do that, we can provide the necessary distraction to lower our stress level and change the channel in our heads from work and obligations, to flying. 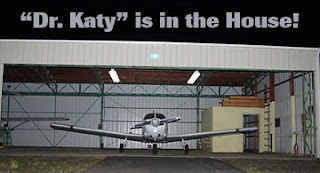 Katy's house is the last hangar on the westernmost end of a group hangar at EUG. It is maybe 10 generous spaces long, with no walls between the stalls. Each guy has their work bench, their stuff, none of which ever gets touched by anyone else...because we are pilots and trust each other. My end of this long space has a small office with a lockable door, so I get the use of this small shelved space to keep my "stuff". My end of the hangar faces EUG's rwy 34L/16R, aka, the field's commercial runway. I usually fire up the old Radio Shack scanner, crack a cold soda, open the doors, and just polish Katy – alone – with a keen eye aimed at the runway waiting to drool yet again on the next wonderful flying machine that drifts into or out of my home patch. In this environment, I am in heaven, just me, the airplane, and all that makes the GA community so great. After a few hours rubbing a nice layer of Supercoat off Katy's Hershey bars, I am usually re-charged and ready to re-enter the Rat Race. I'll be good for a while, until workload and life collide, when I will again head over to Dr. Katy for some hangar therapy. You can have the $250/hour shrink and their couch, I'll take an hour at the hangar, making a 46-year-old bird gleam or sitting on a stool watching Skywest 6404 launch southbound for SFO.